Kitchen Hood Cleaning Service Provider | Vent Hood Cleaning | Restaurant Hood Cleaning | Exhaust Hood Cleaning, Seattle, Tacoma, Bellevue, Vancouver, Federal Way, Kent, PowerClean LLC. 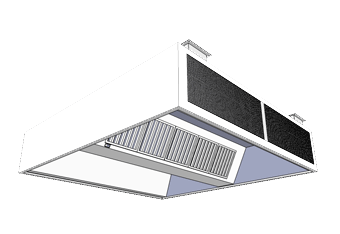 A typical kitchen ventilation system includes a hood or canopy, filters, ductwork, exhaust fan, and a means of providing adequate make-up air. The entire system must constitute a fire-safe assembly within the building. - TYPE I HOODS - are used over cooking equipment producing heat and grease laden effluent. They are designed to handle grease and include a number of integrated components within the hood. - TYPE II HOODS - are used in the collection of steam, vapor, heat, and odors (but not grease). The two sub-classifications of Type II hoods are condensate and heat/fume. 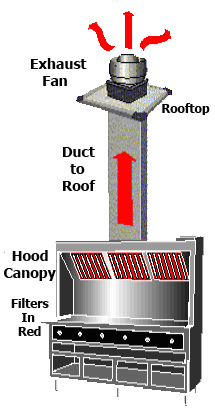 Filters or Extraction Baffles: Collect up to 80% of grease when fans and exhaust systems are working properly. Historically, grease filtration and extraction devices have been, in essence, fire-protection devices. Filters should be kept clean regularly. Three main types of grease filters and extractors in use today include the baffle filter, water wash filter, and dry-cartridge (or removable) filter. Filters also now exist which use a filter media to intercept grease particles. Ultra-violet (UV) treatment is also being incorporated into new hood design. UV light breaks down grease molecules into smaller harmless compounds of carbon dioxide and water vapor, which are carried out with the exhaust airflow. 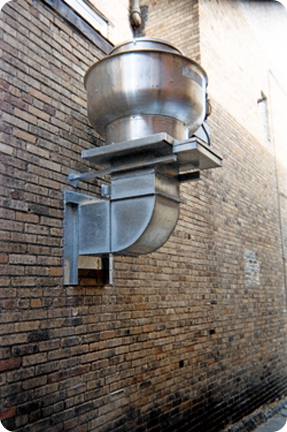 Exhaust Ductwork provides the means to transfer contaminated air, cooking heat, and grease vapors from the hood to the fan. Metal tunnel, ducts direct grease outside of building. Ducts accumulate combustible grease. The duct is often run inside a shaft enclosure and that enclosure is typically constructed of gypsum board, plaster, concrete, or ceramic tiles and must be an approved continuous fire-rated enclosure. 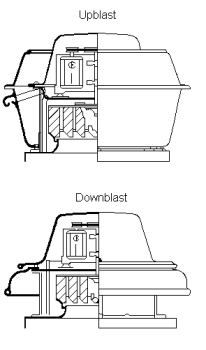 - UP-BLAST & DOWN-BLAST FANS - are typically aluminum centrifugals that are designed for roof mounting directly on top of the exhaust stack. - UTILITY FANS - are normally roof-mounted with the inlet and outlet 90 degrees from each other and are typically used where high-static pressure losses exist. - INLINE FANS - are typically located in the interior duct and are used where exterior fan mounting is impractical.